Discussion in 'Classic Manual Cameras' started by John Seaman, Aug 25, 2018. I've acquired a very beaten up Rolleicord 2 along with a much nicer Rolleiflex Original which I'm hoping to try out soon. 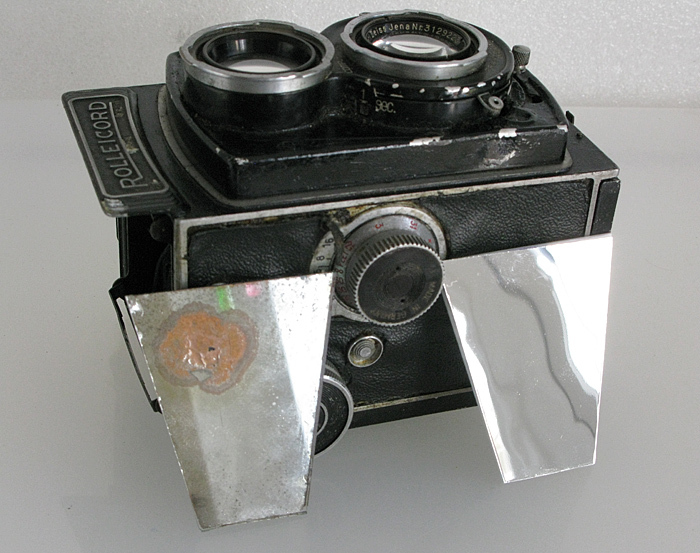 The Rolleicord mirror was very poor, and was clearly a replacement as it was silvered on the rear surface rather than the front, so I decided to renew it. The only time I ever tried to get front silvered glass from an old Polaroid camera, as is often suggested, ended in frustration. I couldn't even get the mirror out in one piece, let alone cut it to shape. I began to wonder if a better alternative might be available nowadays. A local plastics supplier showed me some Silver Mirror HIPS Sheet (HIPS = High Impact Polystryene Sheet) which is silvered on the front, but they only had it in large expensive sizes. An internet search revealed a source of A4 size 1mm thick sheets, and I bought two of these for a very few pounds. Upon arrival I was disappointed to find the 1mm material probably too flexible for what I had in mind, and also carrying a slight natural curl. But then I had the idea of cutting out two pieces and gluing them together back-to back, both stiffening them and hopefully, cancelling out the curl. The material has a protective film on the silvered side, and is easy to cut to size with a craft knife. I cut out two pieces the same size as the old mirror, stuck them together with a thin layer of impact glue, applying pressure with a heavy book until it set. Then I peeled off the protective film to reveal the shiny surface. The resulting 2mm thick mirror was just about the right thickness, but it still didn't look optically flat enough. However I installed it in the camera, and refitted the hood and ground glass screen – in use the slight unevenness did not seem apparent, perhaps because of the short distances involved. It seemed to sit more evenly without the springy "frog" which normally sits behind these mirrors. It remains to be seen how well it performs in practice. There are a few more issues to resolve with the camera first. Keep us informed. I have some old 6cm cameras with oxidized mirrors and would love to re-animate them! This mirror from a reflex Polaroid would probably work fine too. You can find them at thrift stores for a few dollars. These are 1.25mm thick. If you have several TLRs and SLRs that need new mirrors, you can buy a sheet and cut your own. 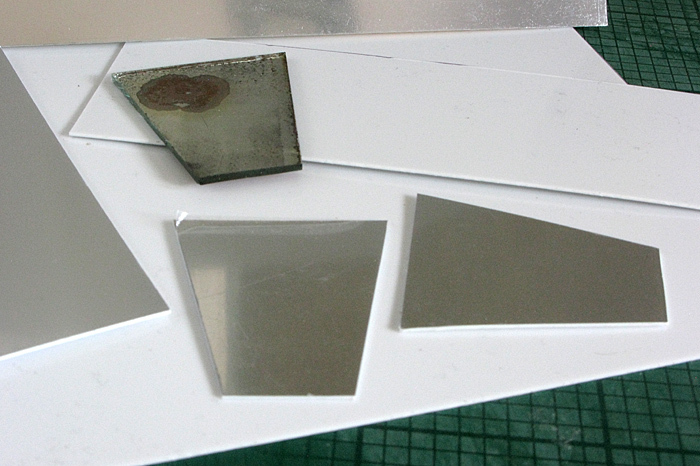 You'll probably want to get a carbide cutter if you're cutting glass substrate mirrors. I've had some time now to try out the plastic mirror, despite the problems with the Rolleicord which include a slightly cloudy viewing lens, and a missing focus magnifier. I have to say that glass is king. The view on the GG screen looks bright enough, but focusing is vague and unsatisfactory. I don't think the surface is optically quite up to it. Heigh-ho. I guess you have to ask your self ... is the finder brighter and easier to use than with the oxidized silver that was in there before... . Ok maybe your material isn't optimal.... but heigh-ho.. it's still a step up! I recall a few years back where someone would cut custom mirrors for any size you like... apparently he advertised same on ebay. I seem to recall the gentleman was in Atlanta Ga.. maybe someplace else in the south. I'll look into it! While the glass is probably deserving of a better solution... your working camera is still a giant step forward. Thanks for the info Chuck. I've decided to treat it a new mirror from him. Well, I received the new glass front-silvered mirror yesterday from the seller suggested by Chuck - remarkably quickly, as I'm in the UK. 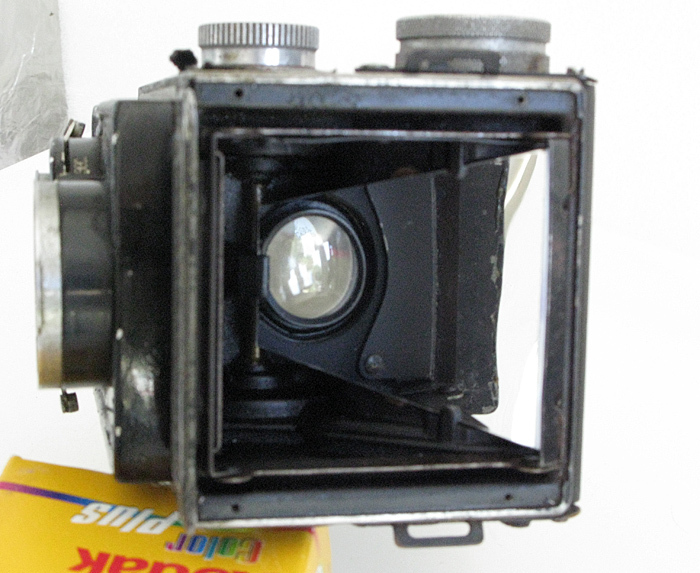 Having just installed it in the camera, focusing is now reasonably "snappy" and normal for a TLR,. So the plastic mirror was not "up to snuff". The non-Fresnel ground glass screen doesn't make for the brightest of views, but it will do. The focus agrees with the scale pretty well. That'S a blessing that the focus agrees with the glass. There'S the old saying about pigs and lipstick, but a Rolleicord'/flex ain't no pig. Our own Rick Oleson offers replacement fresnel screens ..for a reasonable price. If this is a keeper it's probably worth the investment, if good enough is Ok then in the fabled words of Paul McCartney Let it Be.